For other uses, see Brownstone (disambiguation). Brownstone is a brown Triassic-Jurassic sandstone which was once a popular building material. The term is also used in the United States to refer to a townhouse clad in this, or any of a number of aesthetically similar materials. In the 19th century, Basswood Island, Wisconsin, was the site of a quarry run by the Bass Island Brownstone Company which operated from 1868 into the 1890s. The brownstone from this and other quarries in the Apostle Islands was in great demand, with brownstone from Basswood Island being used in the construction of the first Milwaukee County Courthouse in the 1860s. 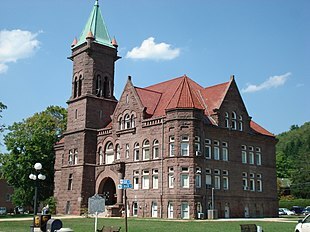 Hummelstown brownstone is extremely popular along the East Coast of the United States, with numerous government buildings from the U.S. states of West Virginia, Pennsylvania, New York, Maryland, and Delaware being faced entirely with the stone. The stone comes from the Hummelstown Quarry in Hummelstown, Pennsylvania, a small town outside of Harrisburg, Pennsylvania. The Hummelstown Quarry is the largest provider of brownstone on the east coast. Typically, the stone was transported out of Hummelstown through the Brownstone and Middletown Railroad or taken by truck up to the Erie Canal. Portland brownstone, a.k.a. Connecticut River Brownstone, is also very popular. The stone from quarries located in Portland, Connecticut, and nearby localities were used in a number of landmark buildings in Chicago, Boston, New York City, Philadelphia, New Haven, Hartford, Washington D.C., and Baltimore. Quarries from the Passaic Formation in northern New Jersey once supplied most of the brownstone used in New York City and in the state of New Jersey. Devonian aged sandstone is commonly used in Southern Wales. There are many brownstones throughout numerous New York City neighborhoods, especially in the Brooklyn neighborhoods of Park Slope, Clinton Hill, Fort Greene, Cobble Hill, Carroll Gardens, Boerum Hill, Gowanus, Windsor Terrace, Prospect Heights, Crown Heights, Brooklyn Heights, Bedford Stuyvesant, and Sunset Park. Smaller concentrations exist in parts of Bay Ridge, Williamsburg, Bushwick, Greenpoint, and Prospect Lefferts Gardens. 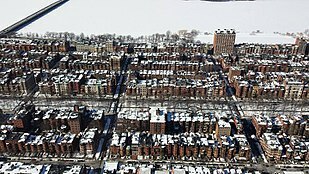 Brownstones are also scattered throughout Manhattan from the Lower East Side to Washington Heights, with notable concentrations in the Upper West Side, Upper East Side, Harlem and East Harlem. 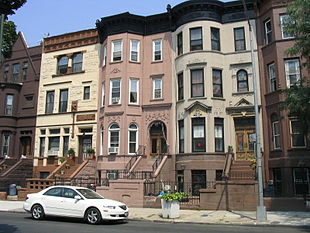 In Queens and The Bronx, the historic districts of Long Island City and Mott Haven also host many brownstones. Brownstones also predominate in some Hudson County neighborhoods directly across the Hudson River from Manhattan, especially in Hoboken and around Van Vorst Park and Hamilton Park in Jersey City. New York City brownstones usually cost several million dollars to purchase. A typical architectural detail of brownstones in and around New York City is the stoop, a steep staircase rising from the street to the entrance on what amounts to almost the second-floor level. This design was seen as hygienic at the time many were built, because the streets were so foul with animal waste. Lately, it has become fashionable to use the term "brownstone" to refer to almost any townhouse from a certain period, even though they may not have actually been built of brownstone. For example, many townhouses in Boerum Hill, Brooklyn are built of brick, but have concrete masonry cladding so they resemble actual stone. There are also many brick townhouses that have brownstone-built stoops throughout the outer boroughs. Such neighborhoods that consist of these homes are Borough Park, Dyker Heights, Bensonhurst, Bath Beach, Kensington, Flatbush, Midwood, East New York, Cypress Hills in Brooklyn, Ridgewood, Glendale, Astoria, Woodhaven in Queens, and Longwood and Morrisania in the Bronx. The Rittenhouse Square and Fairmount neighborhoods of Philadelphia also include examples of brownstone architecture. Many of these homes have been converted into apartment buildings. Back Bay, Boston, is known for its Victorian brownstone homes – considered some of the best-preserved examples of 19th-century urban design in the United States. Although some brownstones exist in Chicago, a similar residential form known as "greystones" is by far more prevalent. A greystone is a type of residential structure that utilizes Indiana limestone for its facade, regardless of its overall architectural style. As in Brooklyn, there exists a "Greystone Belt" in Chicago, with large numbers of such structures located in the south and northwest quadrants of the city. It is estimated that around 30,000 of Chicago's greystones built between 1890 and 1930 are still standing. 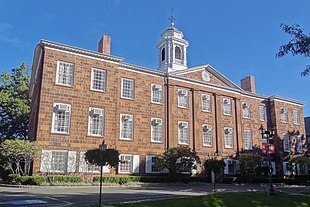 Brownstone, also known as freestone due to its durability and advantages as a building material, was used by early Pennsylvanian Quakers to construct stone mills and mill houses. In central Pennsylvania, some 1700s-era structures survive, including one still used as a residence, known as the Quaker Mill House. Brownstone was deemed "not really much good as a building material" by Vincent Scully, professor emeritus of the history of art at Yale University. Brownstone was popular because it is unusually easy to carve and quarry, but these qualities also made houses clad in it to be susceptible to weathering and damage over time. ^ Muessig, Karl W. (2007). "Unearthing New Jersey" (PDF). New Jersey Geological Survey Newsletter. 3 (1): 1. Retrieved 12 December 2014. ^ Garrison, Ervan G.; Herz, Norman (1998). Geological methods for archaeology. New York: Oxford University Press. p. 205. ISBN 9780198025115. Retrieved 12 December 2014. ^ "NPS.gov: Stone Quarries of the Apostle Islands". nps.gov. ^ "NJDEP-SEEDS-State Rock". State.nj.us. 2007-09-06. Retrieved 2012-05-04. ^ Walsh, Kevin (2003-09-20). "Meeting Across the River: Hoboken, NJ - Forgotten New York". forgotten-ny.com. Archived from the original on March 14, 2018. Retrieved October 7, 2016. ^ "VAN VORST PARK, Jersey City - Forgotten New York". ^ Levine, DB (September 2007). "The Hospital for the Ruptured and Crippled moves east on 42nd Street 1912-1925". HSS J. 3: 131–6. doi:10.1007/s11420-007-9051-6. PMC 2504267. PMID 18751783. ^ "What is a Greystone? | Neighborhood Housing Services of Chicago". Nhschicago.org. Retrieved 2013-02-16. ^ Rozhon, Tracie. "Brownstone (the Real Thing) Comes Back". Retrieved 2018-10-18. NPS Article on the Brownstone quarries of Wisconsin's Apostle Islands. Website devoted to the Weser brownstone quarries from Germany being imported into the US. "After Fight, a Brooklyn Brownstone's Costly Rescue" The New York Times, March 31, 2010. Website devoted to the colonial-era Quaker Mill House in Pennsylvania.